This article was written by singletee with some editing help by the Dominion Strategy blog team. We will be taking a short break from regular posting over the holiday season; have a happy holidays and we’ll see you again with regular content in January. Haunted Woods is one of a trio of 5-cost Duration Attacks from Adventures. It does two things: draws cards next turn, and until then forces other players to topdeck the rest of their hand if they buy a card. Both the draw and the attack can have a significant effect on how you build your deck. The best time to draw cards is at the beginning of your turn, and Haunted Woods gives you three! Starting your turn with 3 additional cards is a huge boost; primarily this helps you get enough sources of +Card and +Action in hand to kick off your turn. It gives you a wider selection of cards to choose from on start-of-turn effects like Ratcatcher or Transmogrify. It also can help you reach big price points early for juicy purchases like Forge, Inheritance, or Citadel. 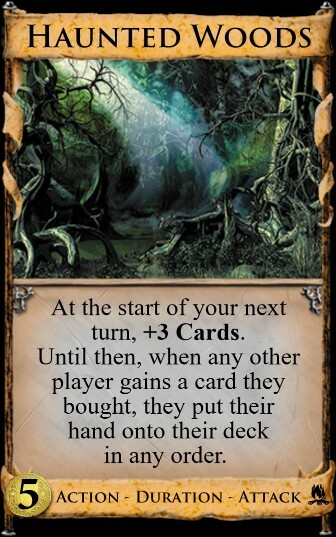 Normally you will want to add some other draw cards to supplement your Haunted Woods as it is not very cost efficient as your only draw: a pair of Haunted Woods only draws as much as a single Smithy if you are drawing your whole deck every turn. The Haunted Woods attack varies a great deal in effectiveness depending on the rest of the kingdom. At its strongest, it can make an opponent lose an entire turn; at its weakest, it can actively help them by allowing them to save cards for their next hand. In order for it to hurt other players, they must have dead cards in hand when they are ready to buy, such as Victory cards, Curses, Shelters, or Ruins. In games where there is no way to get rid of this junk, the Haunted Woods attack will hurt opponents a lot by putting these junk cards in hand over and over. If there is a way to trash or discard such cards, or have a productive turn without buying cards, the attack will be ineffective. Megaturn decks that can hold off greening until they end the game also avoid the attack. The attack also shuts down a few cards in particular: Night cards are played after the Buy Phase, so opponents have to choose between buying a card and playing their Night cards. In addition, a buy from the Black Market makes them topdeck their hand, so they won’t be able to continue playing cards after a Black Market buy as they normally would. In particular, they can’t play another Black Market, nor draw and play their new Black Market buy. The most straightforward way to deal with the Haunted Woods attack is to not have any cards in hand when you buy a card. Trash your starting Estates/Shelters and any junk you receive, and the attack won’t bother you until you begin to add green cards. If you can’t trash your junk, look for a card or event that allows you to discard from hand, such as Hamlet, Vault, or Quest. Another way to deal with the attack is to not buy any cards. Normally this makes it hard to acquire more cards and score points, but this can be a good strategy if you can gain the cards you need by using Workshops or the like, or by buying Events like Ball or Dominate. Even in games where you have to buy cards most of the time, you can skip your buy for one turn to relieve yourself of the accumulating stack of junk. Generic defenses versus Attacks like Moat and Lighthouse also spare you from the Haunted Woods attack. Note that they must be in play (or revealed) at the time your opponent plays Haunted Woods, not at the time you buy a card. Finally, you can use the Haunted Woods effect to your advantage. If you have an extra Village or Laboratory you don’t need this turn, you can use an opponent’s Haunted Woods to topdeck it. If you have a Shepherd or Crossroads, you can save it along with whatever Victory cards you have to set up a big draw at the start of your next turn. Haunted Woods is a strong card that boosts both your deck’s total drawing ability and consistency. It can jump-start your strategy by letting you line up key cards or afford powerful and expensive buys. The attack punishes opponents who green early or don’t clear their deck of junk. While it is sometimes harmless, when it hurts it can be debilitating and difficult to recover from. This entry was posted in Adventures, Articles, General Strategy, Individual Card Analysis, Uncategorized. Bookmark the permalink.